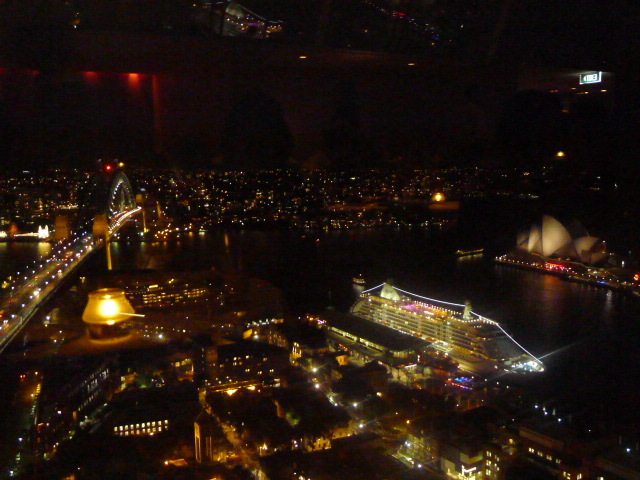 As the name suggests, Altitude Restaurant is perched high up in the sky, in this case the 36th Floor of the glamorous 5-star Shangri-La Hotel in The Rocks Area of Sydney. With its floor-to-ceiling windows, Altitude offers some of the most amazing panoramic views of Sydney Harbour imaginable. But it’s more than just the views that make Altitude Restaurant a knockout destination. The restaurant has won numerous accolades including the Australian Hotels Association (AHA) 2013 restaurant of the year award. Before heading up the kitchen at Altitude, Chef Matthew McCool ran the kitchen at the renowned Aria Restaurant at The China World Hotel in Beijing. And prior to his Beijing stint, Chef McCool spent a number of years fine tuning his craft at some famous London restaurants including Bank, Chez Bruce, Tom Aikens and Gordon Ramsay’s Maze. The décor is decidedly comfortable, and as we watched the sun set over Sydney Harbour we couldn’t think of a better way to kick off our meal than with some champagne and Sydney rock oysters with lemon granite ($27 for six – about £14.70). 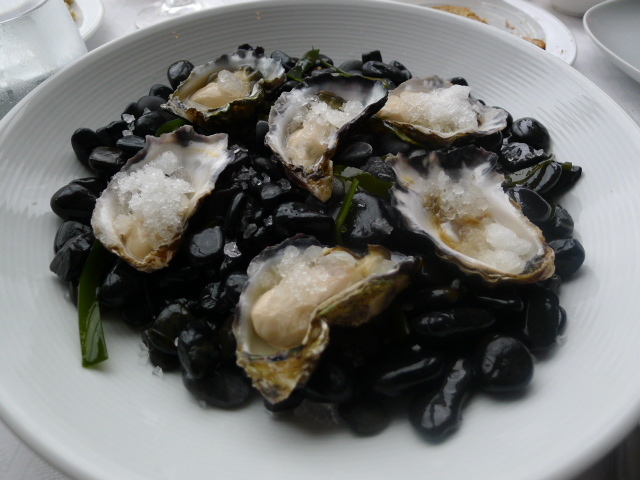 The granite was also great and its zingy, refreshing nature which really worked to heighten the flavour of the oysters. From the oysters we moved to the Epi-curious tasting menu ($150 – about £81.70) with the first course being a deliciously sweet prawn sashimi and spanner crab topped with Sterling Caviar. Served with honeydew melon – cold pressed and in sorbet form – the latter was amazing refreshing and really lifted the dish. 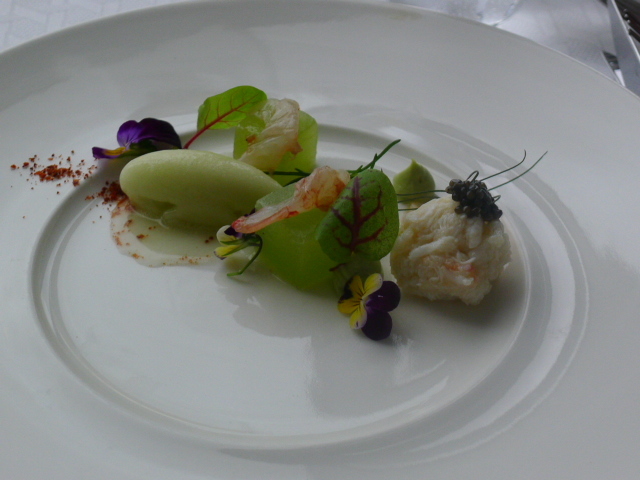 Additional elements included a delicate prawn powder and some aromatic baby sorrel and fennel. The only detraction from the dish was that the crab was a little salty. Next was the confit of Tasmanian salmon which was gorgeous. 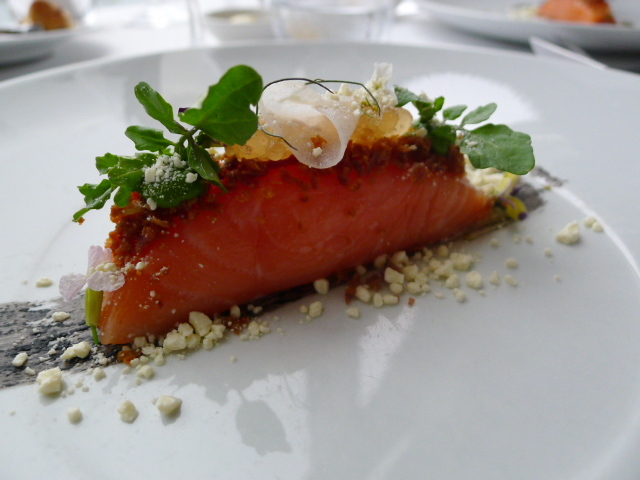 The salmon was succulent and tasty and had been topped with a crunchy tomato caviar for added character. Some Japanese radish had been beautifully pickled and was well judged for acidity. The finishing touches included a horseradish crème fraiche and pancetta soil, both of which were nicely done. Also on the plate was a splash of squid ink which somewhat bitter. Swordfish with sweetcorn, curry and coconut proved to be an amazing dish. The swordfish was beautifully cooked, but it was the fantastic sweet corn puree, sweetcorn powder and aromatic coconut powder which set the dish alight. 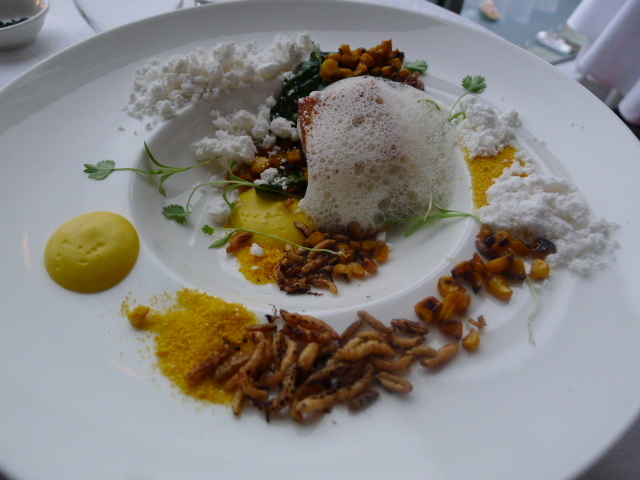 There was also some sweetcorn in white balsamic vinegar, wild rice and curry foam to complete this wonderful ensemble. 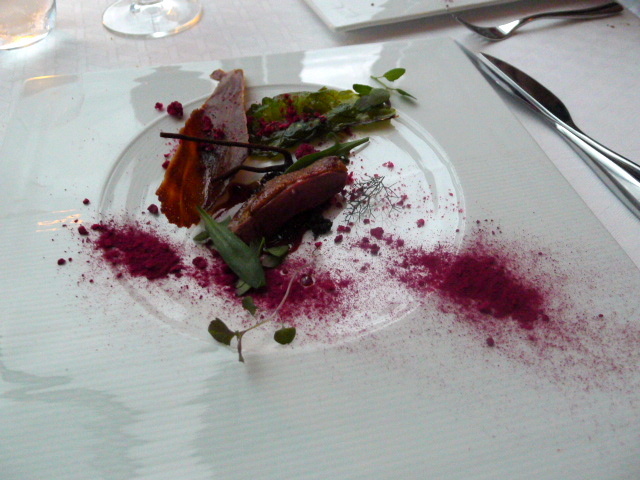 The succulent squab in the next dish had been perfectly cooked and was accompanied by some beetroot powder, olive powder, freeze-dried raspberries, beetroot leaves and a fried dehydrated cauliflower crisp. It was a comprehensive collection of flavours which came together well. The raspberries were particularly successful as they added a touch of zing to the dish. Riverina lamb rolled in a white onion powder revealed perfectly pink meat that was juicy and tender. It was served with a fabulous smoked Persian feta that gave way to an amazing depth of flavour. Freeze-dried blackberries provided a lovely sweetness and crushed almonds and puffed quinoa both added texture. 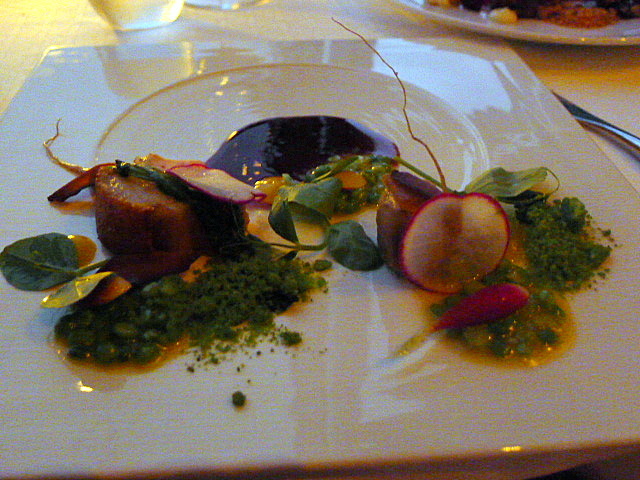 There was also some lovely celeriac puree, but some jus on the plate would have helped to complete the dish. Kurobuta pork was lovely with a super crunchy crackling and was accompanied by a sliver of abalone, snow peas, radishes and a hint of lavender. The accompanying pork jus was also amazing. Pre-desserts included two mini ice cream cones of passionfruit and vanilla, and raspberry with chocolate which we enjoyed. This was followed by the dessert in the degustation menu of refreshing wild berries with orange blossom, kaitifi filled with an excellent ricotta and a pistachio crumble topping. We substituted one of our degustation desserts with another dessert from the a la carte menu, the burnt honey mousse which featured a sheep’s milk yoghurt, conoli pastry, lemon thyme and almonds. This was simply gorgeous with its creamy flavours and crunchy textures. We adored the tasting menu. We might have had a few minor quibbles, but otherwise the cooking was pretty much faultless. The eclectic nature of the menu and the clever combination of ingredients also served to display inspiration and ingenuity. When you combine such lovely food with the amazing views and the effusive charming service, Altitude definitely reaches high for the skies. 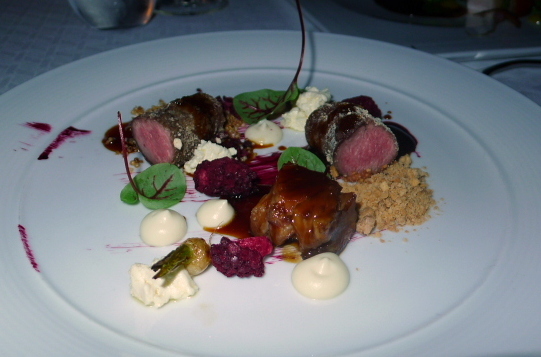 Three courses – $80 to $98 (about £44 to £54). The Epi-curious tasting menu is $150 (about £82).